Ernie Wiens, beloved husband, father, grandfather and brother went to be with his Lord on September 7, 2016. 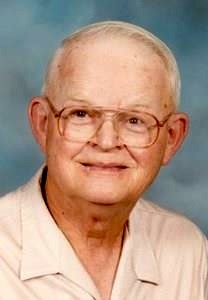 He was born in Inman, Kansas on November 26, 1928, to John and Anna Wiens, who preceded him in death. Ernie was an educator, teaching hundreds of junior high school students during his teaching career in central Kansas and the Olathe School District, where he taught for more than 25 years. Ernie was much more than a teacher, caring about his students on a personal level. He often spent time with students outside of school who were struggling with life issues, hoping to share with them his concern and love. In addition to teaching, he invested in young adults by coaching basketball and football. Ernie loved all sports, particularly basketball, which he played, and football. He attended numerous sporting events over the years, and was happiest when he was watching the Kansas Jayhawks play. He was an avid collector, visiting numerous garage sales to find treasures that others did not recognize, loved country music, the “old timers,” and enjoyed walking with friends when his health permitted that exercise. He was preceded in death by his wife, Barbara, the love of his life who he met while doing 1W service in Connecticut during the Korean War. He is survived by his children Brent Wiens, Savannah, Georgia; Cindy McKimm, Lenexa, Kansas; Craig Wiens (Mary), Merriam, Kansas; and Jeff Wiens (Janet) Bartlett, Tennessee. Ernie also leaves behind his four cherished grandchildren, Alyssa, Amy, Mallory and Karch. Also remaining are his sister Freida (Milford) Harder, Wilber (Rita) Wiens, and Ed (Twila) Wiens and numerous nieces and nephew. Ernie had a deep faith in God and in Jesus, and lived a life that reflected the grace he had been given. He was gentle of spirit, a faithful friend, and a great father, grandfather and brother. His family would like to thank the staff of the Good Samaritan Home, who gave him such loving and attentive care after he moved there, and who surrounded his family during the time of his transition from this live into the life eternal. Funeral services will be 11a.m. Friday, September 9th at the McGilley-Frye Funeral Home 105 E. Loula St. Olathe, KS. Interment in Olathe Memorial Cemetery 738 N. Chestnut Olathe, KS. Visitation will be 6-8 p.m. Thursday, September 8th at the funeral home. In lieu of flowers memorial contributions may be made to: Meals on Wheels or Good Samaritan Society.